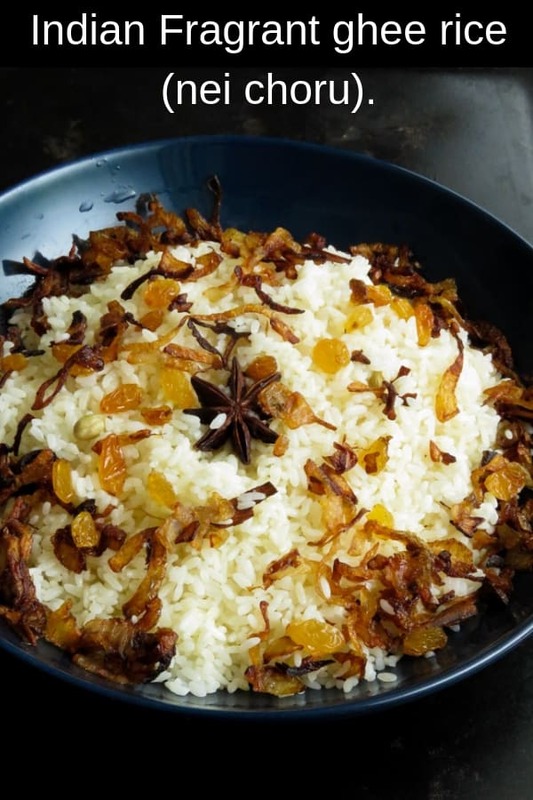 Indian fragrant ghee rice(nei choru). Turn any type of rice into a special dish by cooking this fragrant ghee rice. Whether it’s basmati or your regular white rice, with a few aromatic spices, you can create a festive rice for any occasion. Rice being a staple in most Asian countries, knowing a few ways to elevate the taste of the grain, can bring variety to it. One way of doing this is by cooking the rice in ghee with a few aromatic spices. 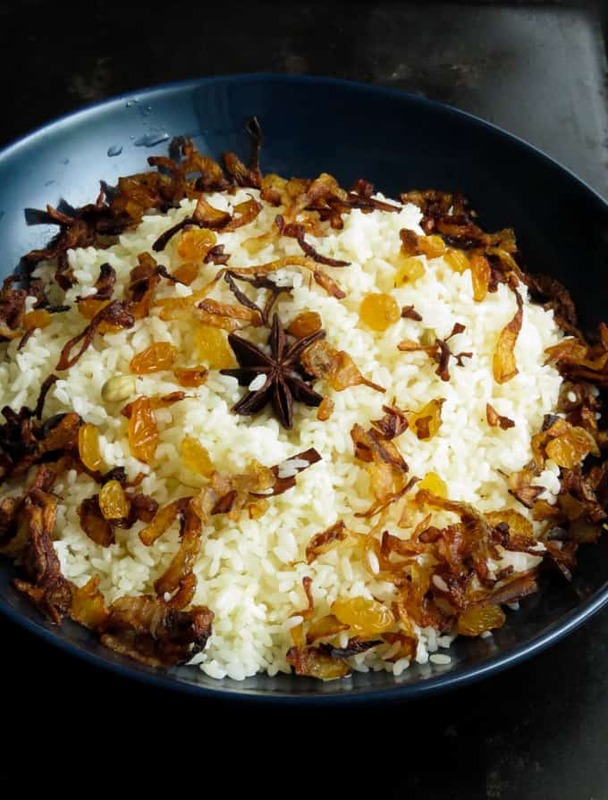 This recipe is a south Indian rice recipe also known as nei choru. It’s quite similar to the kidu rice we serve, only simpler than the ghee rice. Types of rice you can use to make the Indian ghee rice. You can actually use both Basmati and white rice to make the Indian rice recipe. The most essential ingredient to making the perfect ghee rice is using the best ghee you can find. Once you have the ghee and the whole spices, it’s a matter of following the step-by-step process of cooking the ghee rice. When to serve ghee rice. You can make it for Ramadan as a Friday special to serve your loved ones when they come after their prayers, a small gathering of friends or a family dinner. 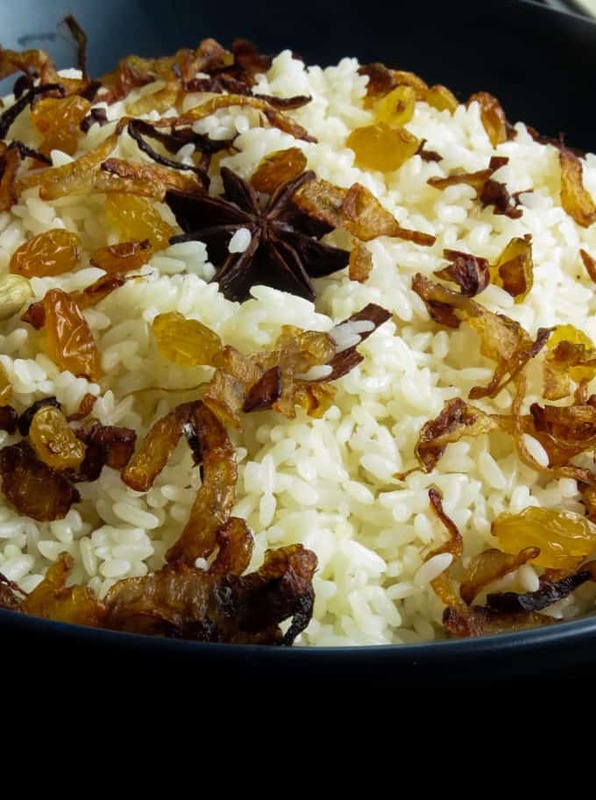 These are a few special occasions you can serve the ghee rice. 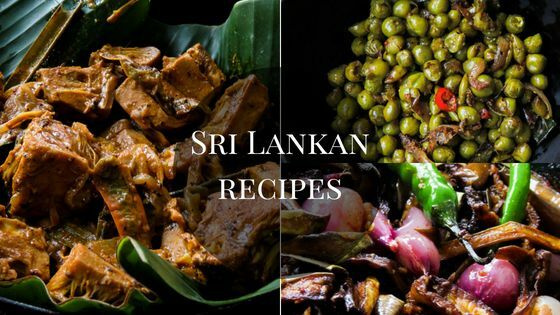 Can I turn leftover rice into ghee rice? Yes, you can. I’ve done it a couple of times. Simply add the tempered spices and ghee to the rice and combine well. This turns your leftover rice into a very aromatic bowl of rice. 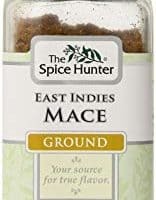 What are the aromatic spices you use here for the simple rice pilau? 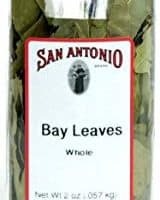 I’m using cinnamon, cloves, green cardamom, star anise, strands of mace and bay leaf. 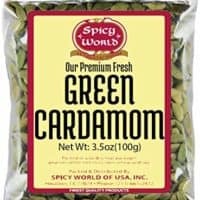 Can I use butter instead of ghee for the recipe? Yes, but I would recommend using ghee always. You need ghee to give the rice its unique taste. only use butter when you are unable to find ghee. 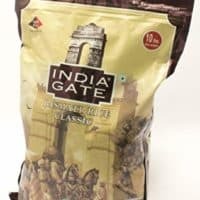 Where can I find ghee? 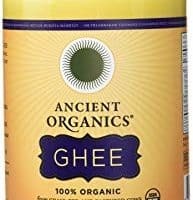 Most Asian stores, the Asian/Indian aisle section or the oil aisle should be the first places to look for ghee. 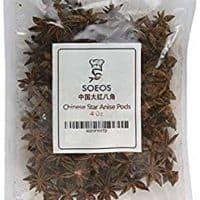 What are the garnishes I can use for the simple Indian ghee rice pilaf? I love using a good amount of ghee fried, onions, raisins and cashews on my rice pilau. You can reduce the amount of fried onions if you prefer less. 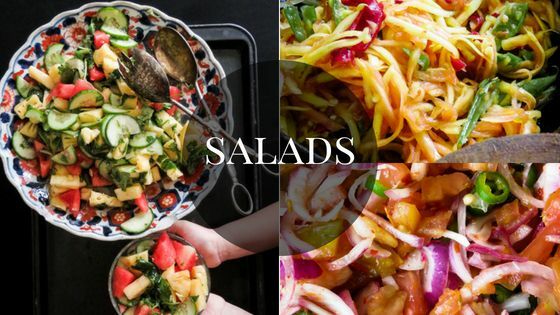 Using the quantity of garnishes mentioned here is up to you. You can also leave out the Cashews and raisins as garnish if that is your preference. 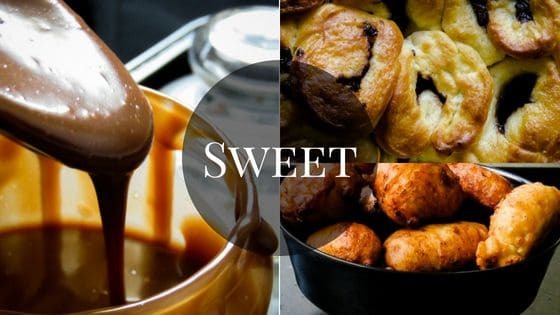 Save the recipe to your favourite Pinterest board. Bowl to wash the rice. A large pot to cook the rice. A small frying pan to fry the onions and spices. 2 smaller bowls covered in paper towels. Beginner’s guide in making perfect ghee rice. Use a brand of rice you are familiar with, you can use both basmati and keeri samba to make the ghee rice. Make sure the water to rice ratio is correct. keep in mind that Basmati rice needs less water than the regular samba rice. 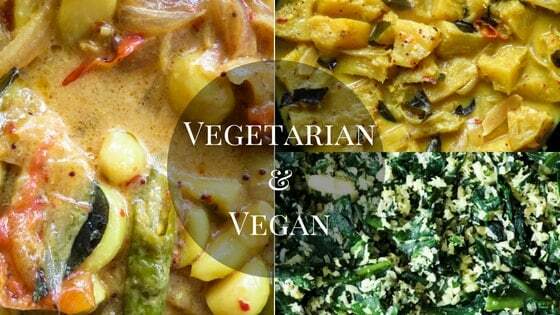 You can use the stovetop or the rice cooker. I am giving you the option of using basmati or regular rice to make the rice pilau. Only the amount of water will change as per your choice of rice. The quantity of water is mentioned below for both types of rice. 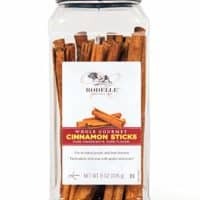 There will be no change in the other ingredients used. Rinse rice a few times, drain and set aside. 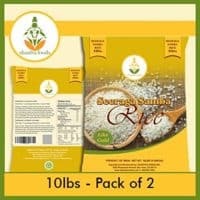 If using Basmati, rinse the rice then soak the Basmati in water for 20-30 minutes or as per instruction on the package. Drain and set aside once the soaking is done. Shallow frying the Onions and garnishes. Slice the Onions and set aside. Place a frying pan over low-medium heat and add ghee to it, let the ghee melt for a few seconds. Separately, shallow-fry the cashews(until golden) and raisins(until they become plump) for a few minutes. Transfer to a paper towel covered bowl. Add the sliced onions with a few more ghee spoons if required and fry them till they are crispy and turn golden brown. Transfer to a separate bowl covered in paper towels. Place the large pan over medium heat and transfer any leftover ghee from the frying process of the garnishes and onions to this pan. Add the whole spices and gently cook them over low heat until they release their aroma, this should take no more than 2-3 minutes. make sure not to burn them. Add two tablespoons of fried onions to the whole spices, followed by the washed rice/basmati. 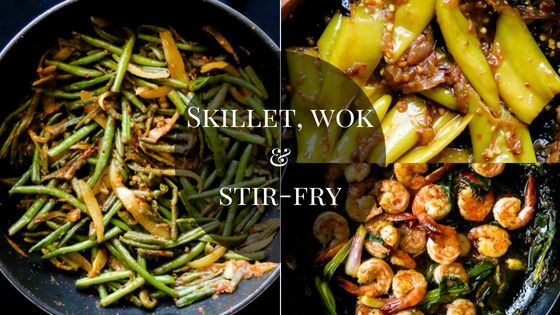 Combine rice over low heat with all the ingredients in the pan for 3-5 minutes. Add water(amount of water for regular rice and basmati rice given on ingredient list)or use the amount of water mentioned in the packaging. Season with salt, cover with a lid and use medium heat to cook the rice until the water is absorbed. Check the rice once the water is absorbed. If the rice is still hard(usually in the middle)and needs to cook for a few minutes, add 2-3 tablespoons of water and continue to cook till water evaporates. Once the rice is cooked, remove the pan from fire(or the rice will continue to cook)and fluff the rice with a fork. Allow the rice to rest for 5 minutes without covering it. Transfer rice to the serving dish and garnish with the leftover Onions and raisins and cashews. 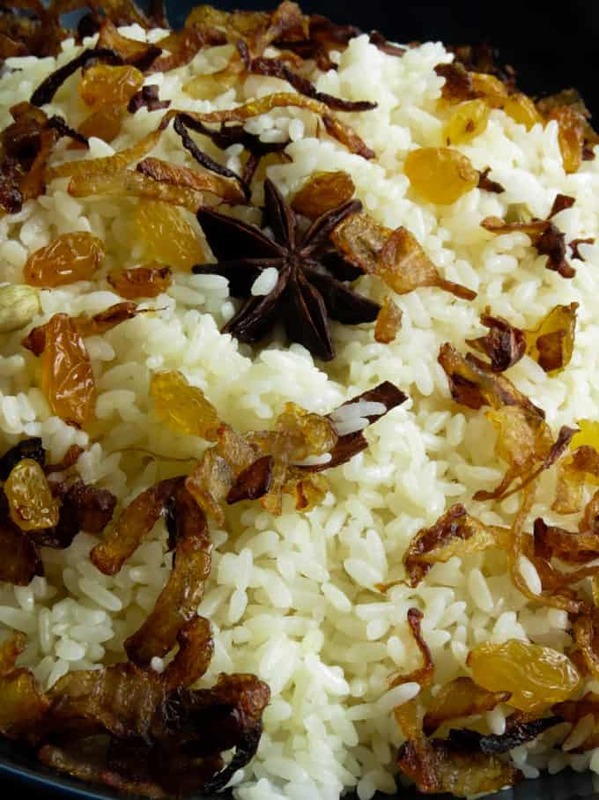 TURN ANY TYPE OF RICE INTO A SPECIAL DISH BY COOKING THIS FRAGRANT GHEE RICE. WHETHER IT’S BASMATI OR YOUR REGULAR WHITE RICE, WITH A FEW AROMATIC SPICES, YOU CAN CREATE A FESTIVE RICE FOR ANY OCCASION. 2 cups of basmati rice or 2 cups of regular keeri samba rice(see notes on basmati or regular rice).